1. On April 1st, the MPRB passed the following resolution to fund the difference between whatever the final figure raised by Minneapolis Swims ends up, and the final cost to finish “Reduced Option B”- sketch attached. 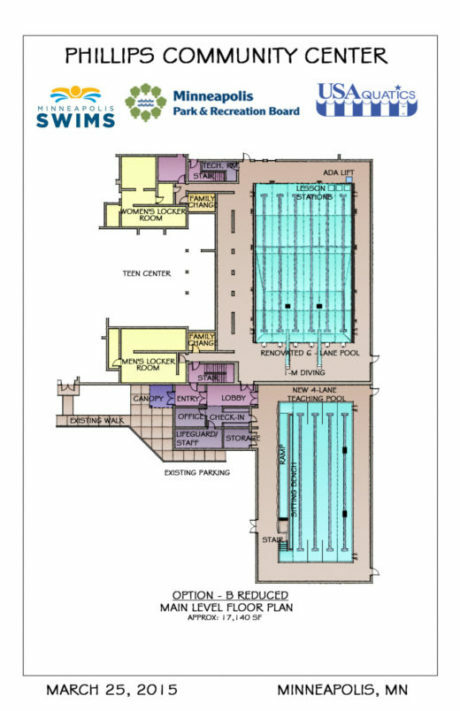 Resolution Authorizing Selection of Option B – Reduced for the Phillips Community Center Aquatic Facility Using a Mortgage as a Source of Funding and Not the Capital Budget. Furthermore that Staff Report Further Findings Regarding Capital Funding, Operations Costs, and Construction Cost Estimates for the Board to Consider on July 15, 2015. 2. With the recently announced grant of $200,000 by the Piper Family Foundation, we have raised just over $3M now towards the generous estimate of $5.4M cost of building “Reduced Option B”. Our goal is to raise another $1,000,000 before the campaign ends. 3. 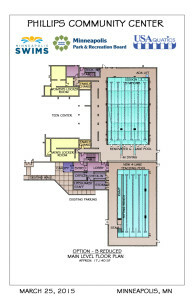 At last night’s MPS Board meeting, Finance Chair Gagnon announced that the committee unanimously approved authorizing District leadership to begin conversations with MPRB leadership to explore a Capital contribution by MPS that would give them equity in the Aquatics Center, and increase the lane count in the main pool to 8, giving them a permanent 8-lane competitive District pool. This is expected to be voted on by the full board at next month’s meeting. The high end estimate for this increased size would be $2.5M, bringing the total cost to $7.9M.